John Paul Tsahakis « James McElroy & Diehl, P.A. After receiving his Bachelor of Arts from the University of North Carolina at Chapel Hill, John Paul Tsahakis spent a year abroad working in Greece. He returned to Chapel Hill in 2006 to earn his Juris Doctor at the University of North Carolina School of Law, where he was an active member of the Holderness Moot Court Bench. In 2009, John Paul had the honor of competing in the National Environmental Moot Court Competition in New York. 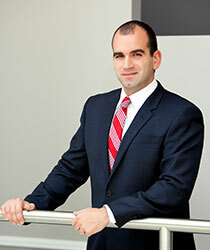 Raised in Charlotte, John Paul moved back to Charlotte directly following law school to join JMD in September of 2009. John Paul became a partner in the firm in 2014. At James, McElroy & Diehl, John Paul focuses his practice on issues relating to child custody, child support, spousal support (post separation support and alimony), equitable distribution, and domestic violence.